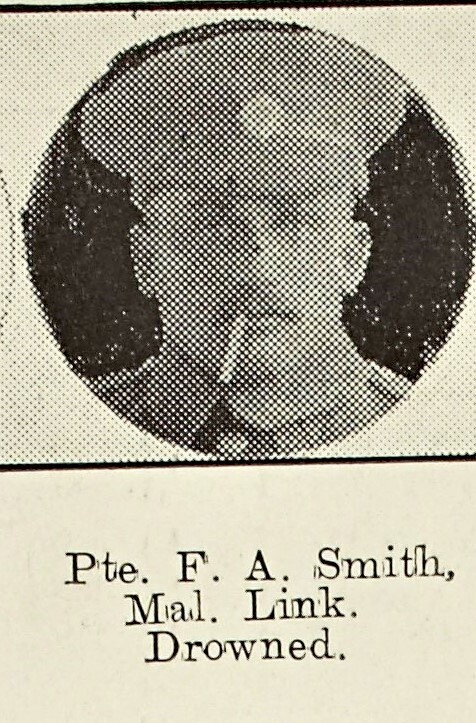 In May 1917 Mr and Mrs A E Smith, Lower Howsell, received information that their only son, Pte Frederick Albert Smith, Devonshire Regiment drowned on the 15th April when the Transport Ship Arcadian sank. He was 26 and unmarried. Mr A C Nott, grocer of Malvern, formerly employed him. He joined the Royal Horse Artillery soon after the outbreak of War, but whilst training on Salisbury Plain contracted double pneumonia and was discharged. In 1916 he joined the Worcestershire Regiment and transferred to the Devonshire Regiment shortly before he sailed. He was the organ blower at St Matthias Church (the person that operated the manual pump for the organ bellows).